SCDNR will offer courtesy boat inspections Sept. 3-4 to help ensure everyone is safe on the water during Labor Day weekend. The S.C. Department of Natural Resources (SCDNR) Law Enforcement Division will be conducting courtesy boat inspections at certain public boat landings in preparation for Labor Day weekend. This holiday is among the busiest times of the year for South Carolina lakes and waterways, and boating safety is highly encouraged in hopes of keeping everyone's weekend fun and safe. SCDNR boating safety and enforcement officers will perform quick but thorough inspections for required safety equipment and proper boat and motor registrations. 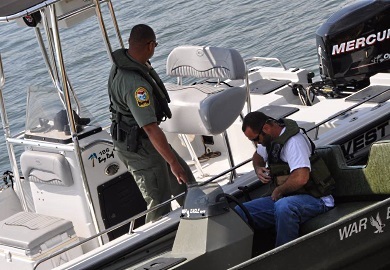 Those who are not in compliance with safety regulations or registration requirements will not be ticketed and will be given an opportunity to correct the problem before they launch their boats. SCDNR officers will also answer questions and offer additional safety tips regarding safety on the water. To report boating violations such as reckless operation or an intoxicated boat operator, call the SCDNR toll-free, 24-hour hotline at 1-800-922-5431 or dial #DNR on your cellular phone. Clarendon County: C. Alex Harvin III Boat Ramp - Lake Marion: 9 a.m. – 11 a.m.
Lexington County: Lake Murray Dam - Lake Murray: 9 a.m. – 11 a.m.
Anderson County: Riverfork Boat Landing - Lake Hartwell: 2 p.m. – 4 p.m.
Beaufort County: Cross Island Landing - Broad River: 10 a.m. – 12 p.m.
Berkeley County: Cypress Gardens Landing (Dunham Creek) - Dunham Creek: 10 a.m. – 12 p.m.
Charleston County: Buck Hall Landing - ICW in Awendaw: 10 a.m. – 12 p.m.
Charleston County: Wappoo Cut Landing - South of Charleston Harbor on ICW: 10 a.m. – 12 p.m.
Chesterfield County: Morrison Landing - Lake Robinson: 11 a.m. – 1 p.m.
Dorchester County: Herbert H. Jessen Landing - Ashley River: 10 a.m. – 11 a.m.
Fairfield County: Wateree State Park Landing - Lake Wateree: 2 p.m. – 4 p.m.
Georgetown County: East Bay Street Park - Sampit River: 10 a.m. – 12 p.m.
Horry County: Bass Pro Shop Landing - HWY 22 at HWY 17 on ICW: 10 a.m. – 12 p.m.
Marion County: Galivants Ferry Landing - Little Pee Dee: 10 a.m. – 12 p.m.
Pickens County: Gap Hill Landing: 10 a.m. – 12 p.m.
York County: Buster Boyd Landing- Lake Wylie: 10 a.m. – 12 p.m.